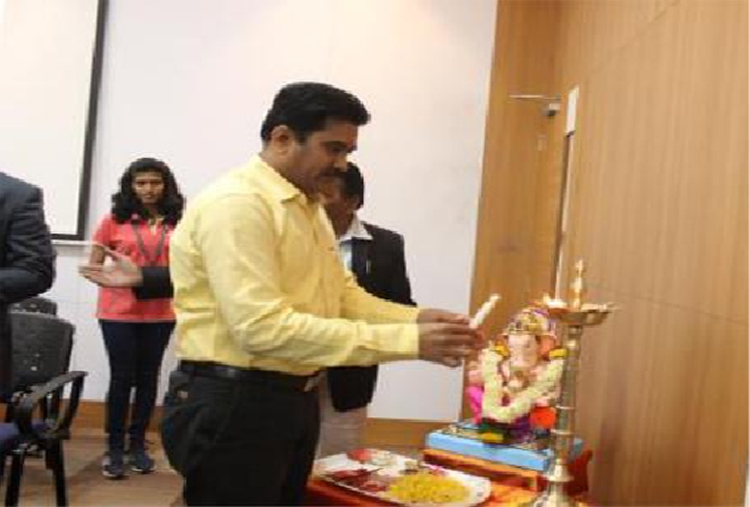 Sunil Patil – Head of Spectrum Academy. 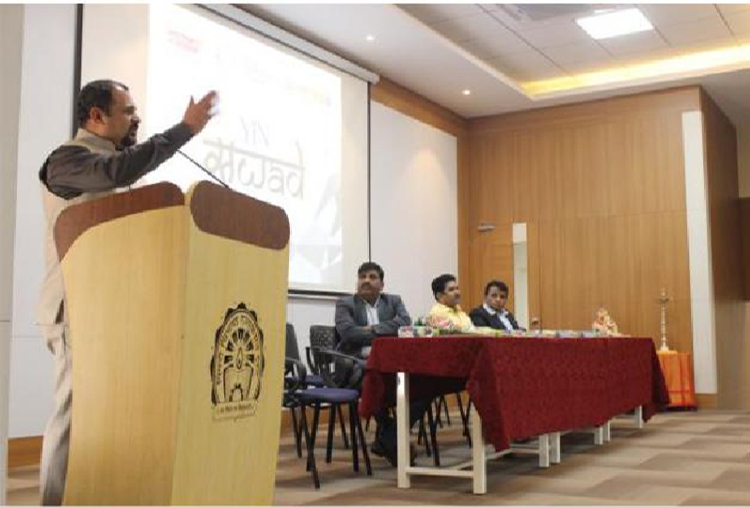 Topic: Talk on inspiring youth to join IAS. Venue: At, Auditorium- SBPCOAD Building. Attended by: Faculty and students of all colleges under PCET. 1. Enlighten the students about the various administrative exams and job opportunities. 2. 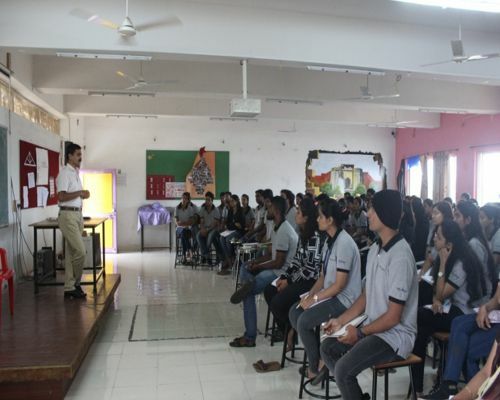 Clear doubts, apprehension of the Indian Administrative Service and future career prospects. 3. Motivate the youth to give competitive exams. 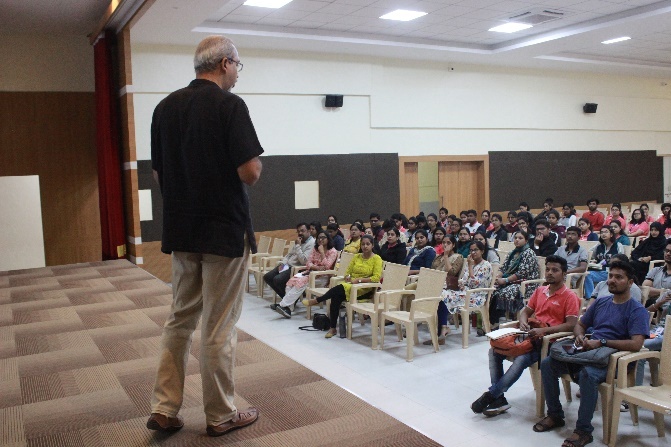 The talk was arranged by Sakal Yin in collaboration with PCET and organized by Prof. Kavita Patil, Prof. Shilpa Patil and the Faculty of SBPCOAD. 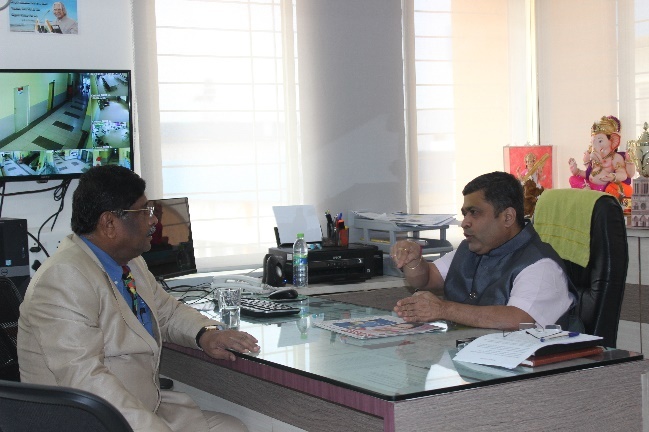 Mr. Shravan Hardikar (IAS) explained the need to give competitive exams and join the Administrative services to serve the Nation. He cited examples of his life and what inspired and motivated him to join the Services. 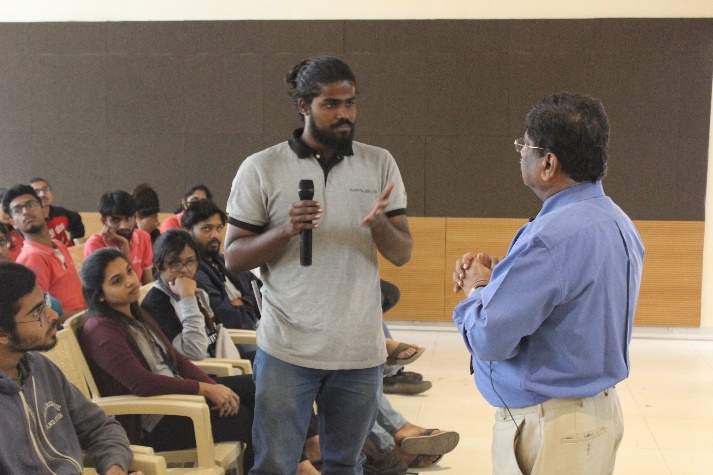 He extolled the students to get self-motivated, inspired and take decisions about their life on their own.He emphasized that the Nation needs young people with new ideas to be a Progressive Nation. 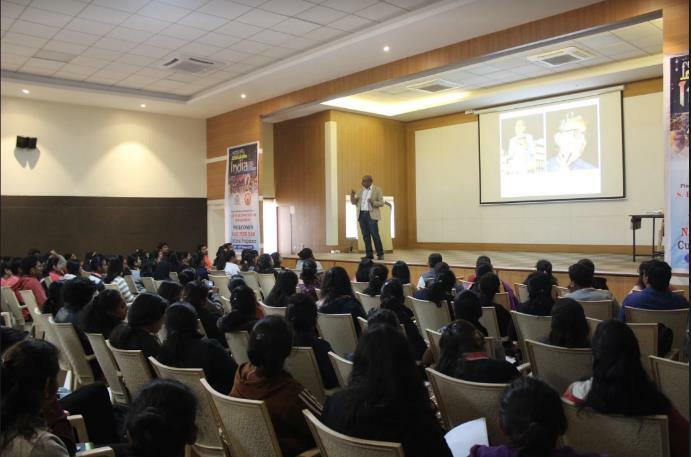 Mr. Sunil Patil (Head of Spectrum Academy) explained who is eligible for the Competitive exams and how they can go about it. He gave information about his Academy and its virtues. 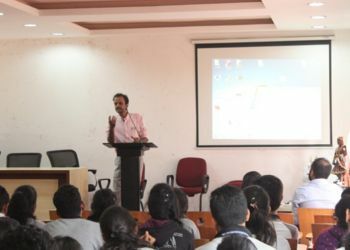 PCET’s Trustee Mr. Kazi Sir, spoke about how the students can look to new avenues of going ahead in life and stressed on the importance of becoming self-sufficient and self-reliant. 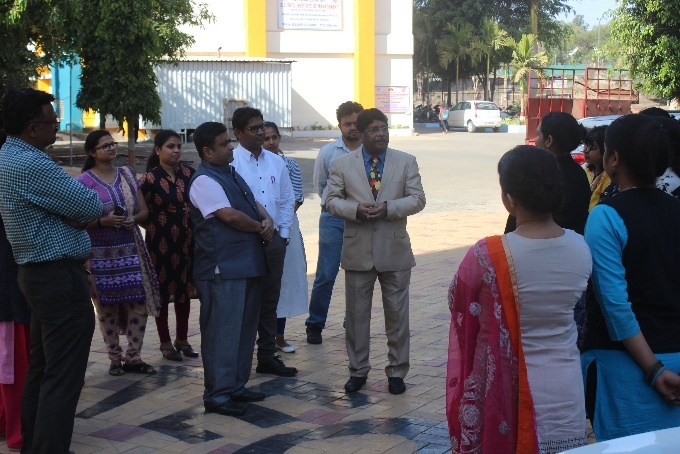 Inspite of being given a very short notice of one and a half day to arrange and organize everything, it was a very successful event as all the staff of SBPCOD under the guidance of Principal Dr. M H. Sonawane Sir, rose to the occasion and did their best. The students also worked diligently and with enthusiasm to get everything done in time. Design Process & Methodology by Ar. 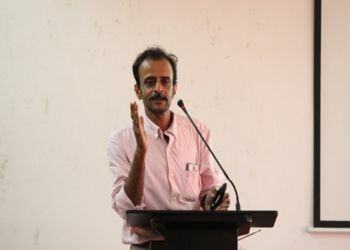 Chetan Sahastrabudhe. 2. 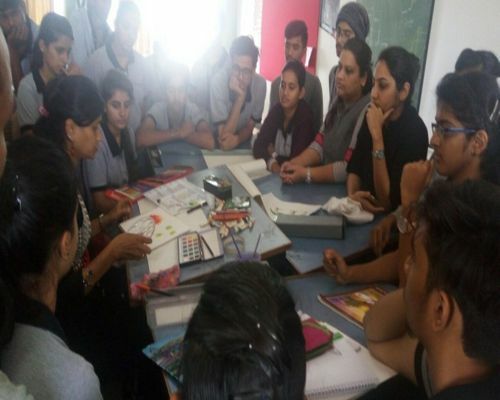 Introduction to teaching methodology for faculties. 3. How faculties should guide to their students in design studio. 4. How to proceed Design from concept to its implementation. The event started with the felicitation and small introduction of the chief guest. The guest lecture was preceded by a short talk of the dignitaries. 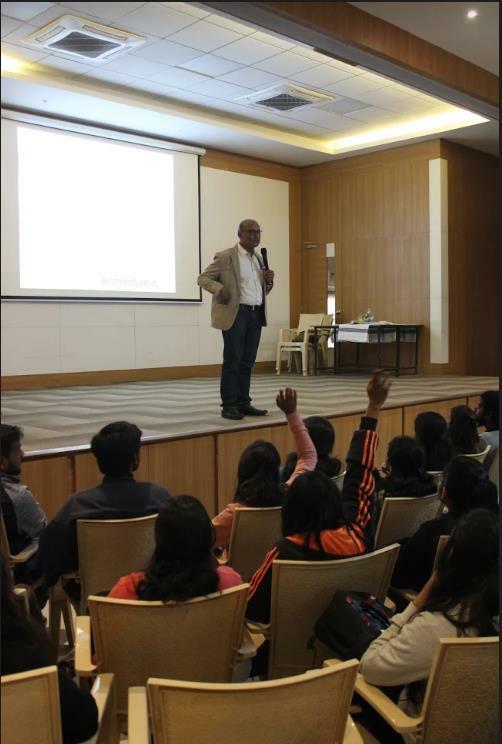 Then the session continued by the speaker Dr.Chetan Sahasrabudhe, who is the Professor in BNCA & he is Principal Architect of Chetan Sahasrabudhe Architects. He explained student’s step by step process of Design to achieve the end product. To teach in studio he explained faculties design methodology and how to reposed different types of issues by students. The session started around 10.00 am and ended around 12.30 pm. 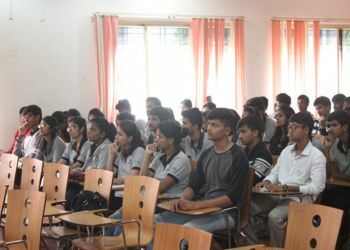 The session was received with admiration by the students. The event ended with questioner session and vote of thanks. Introduction to Thesis / Architectural Project – II by Ar. Prasanna Desai. The event started with the felicitation and small introduction of the chief guest. 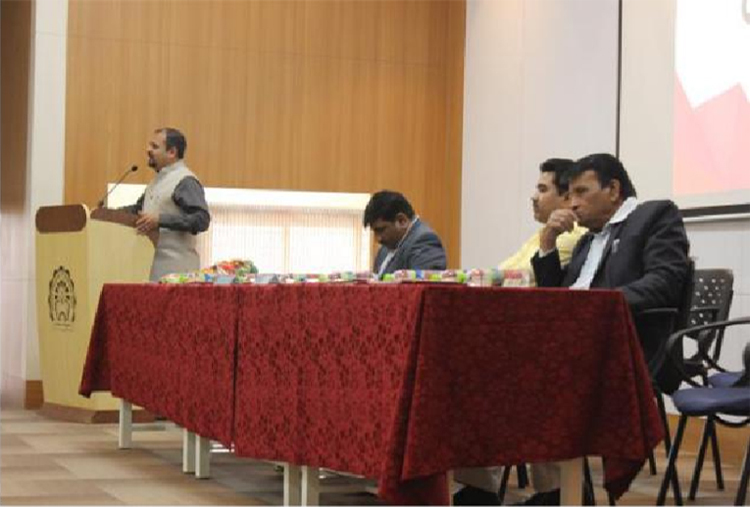 The guest lecture was preceded by a short talk of the dignitaries. 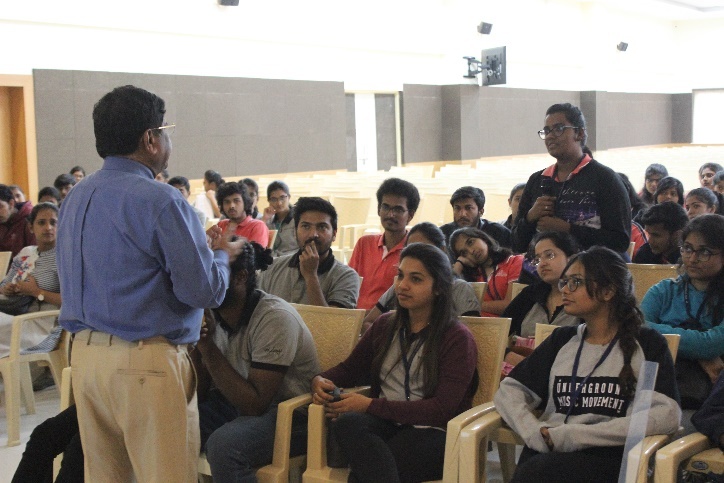 Then the session continued by the speaker Ar.Prasanna Desai, who is the Director & Principal of VIT’s PVPCOA he is Principal Architect of Prasanna Desai Architects. He showed his students Thesis / Architectural Project - II work done under his guidance. As well as different types of Stages of Design Models while working on Thesis / Architectural Project - II . The session started around 10.00 am and ended around 2.00 pm. 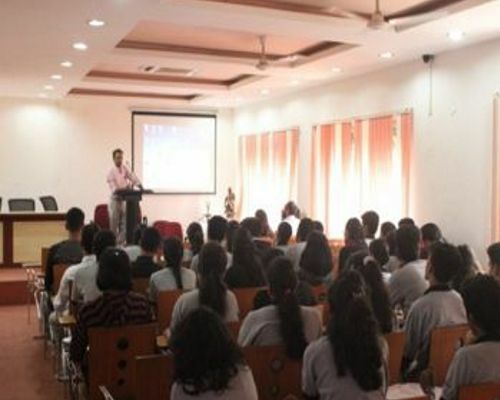 The session was received with admiration by the students. The event ended with questioner session and vote of thanks. 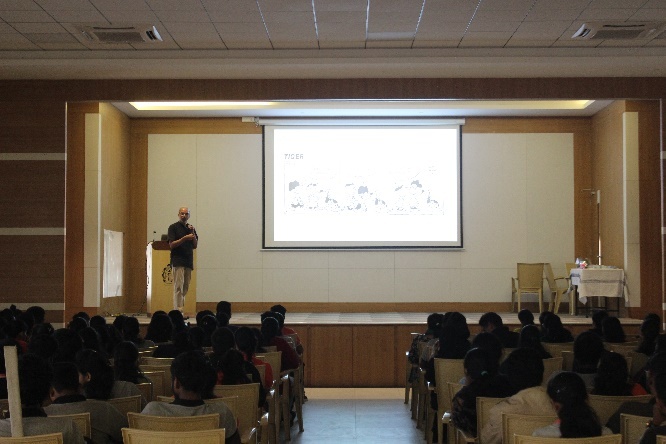 Zero to Hero – Motivational Lecture to Yong Budding Architects by Ar. Prashant Deshmukh. The event started with the felicitation and small introduction of the chief guest. 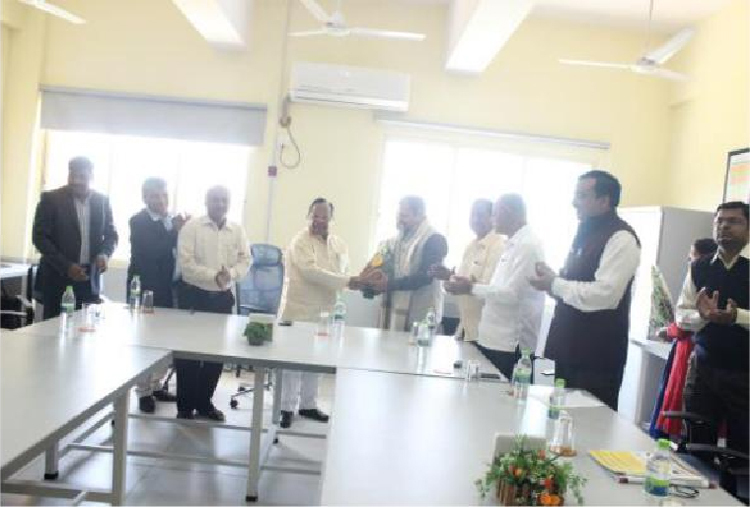 The guest lecture was preceded by a short talk by the dignitaries. 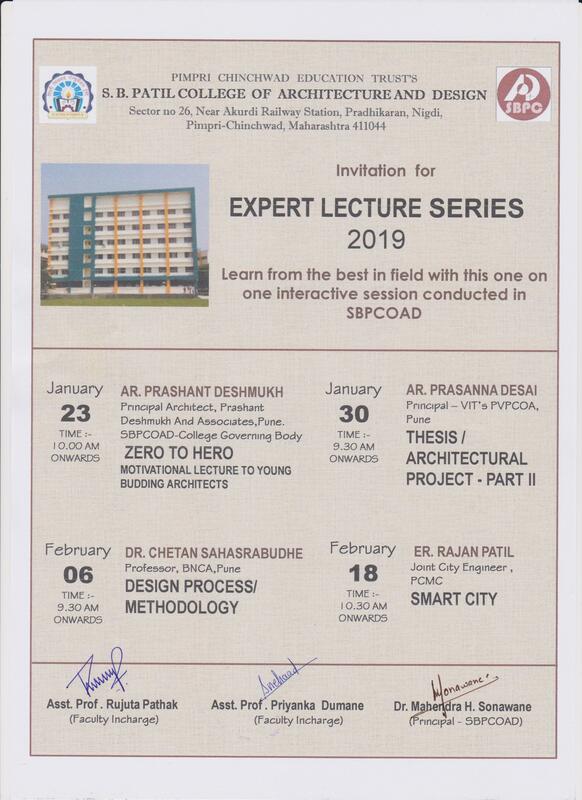 Then the session continued by the speaker Ar.Prashant Deshmukh who is the Principal Architect, Prashant Deshmukh And Associates,Pune and also he is on College Governing Body of SBPCOAD. 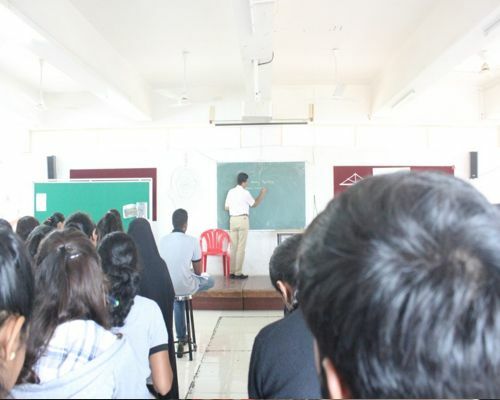 In his talk he emphasized the importance and meaning of ” ZERO TO HERO” by giving the examples. The session started around 10.00 and ended around 3.00 PM. The session was received with admiration by the students. The event ended with questioner session and vote of thanks. Spirit of Entrepreneur by Mr. Manish Gupta. The event started with the felicitation and small introduction of the chief guest. 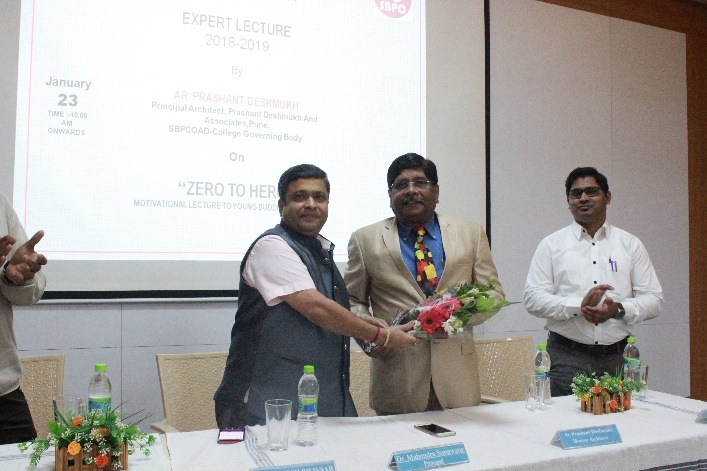 The guest lecture was preceded by a short talk by the dignitaries. 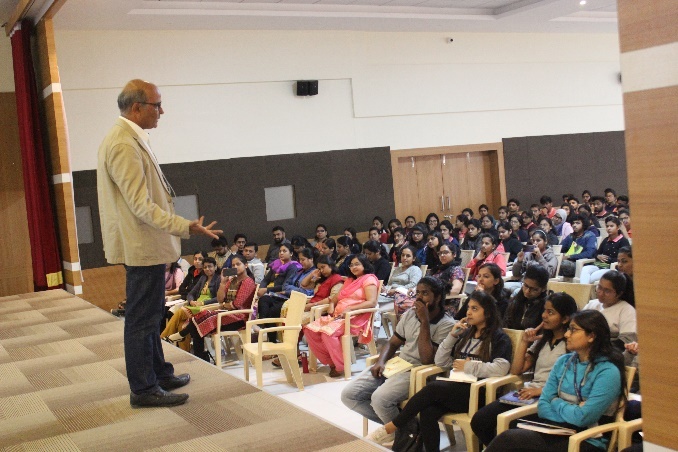 Then the session continued by the speaker Mr. Manish Gupta who is Chairman of Chrysalis Group. 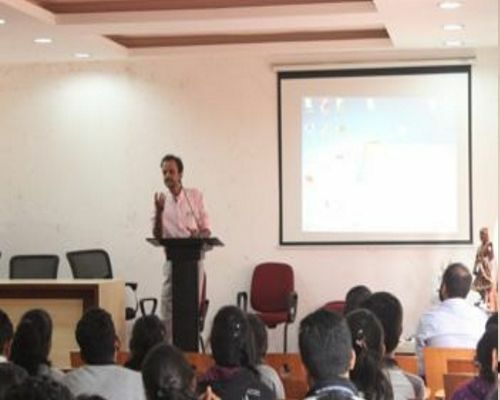 In his talk he emphasized the importance and meaning of Entrepreneur by giving the examples. Vision behind this session was we are driven by a very empowering vision of making a contribution to the growth of our country by strengthening the entrepreneurial fabric across India. 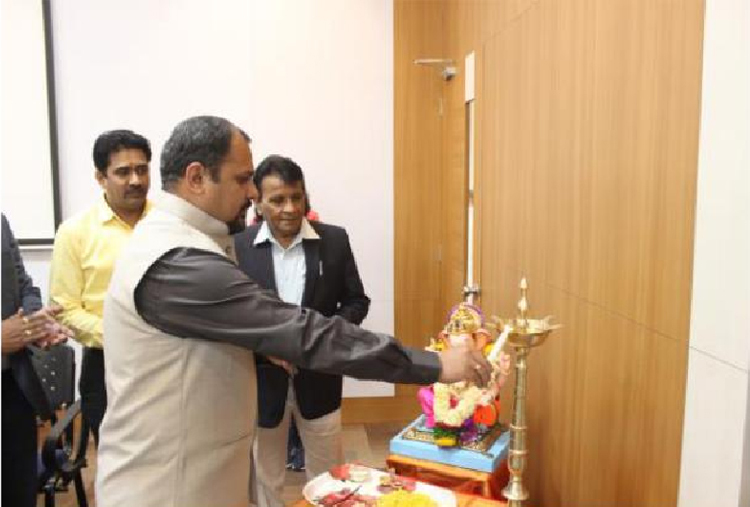 Under this vision one of the major areas of focus for them is showing the seeds of Entrepreneurship amongst the youth of our country through an initiative ‘ISE’-‘Igniting the Spirit of Entrepreneurship’. The session started around 10.00 and ended around 12.00 PM. The session was received with admiration by the students and they also found the slides appropriate. The event ended with questioner session and vote of thanks. 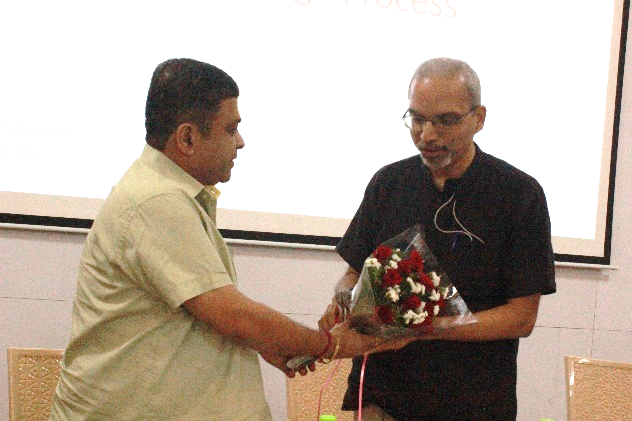 Principal Dr. Mahendra Sonawane with his SBPCOAD faculty facilitating the Chief Guest Mr.Manish Gupta. 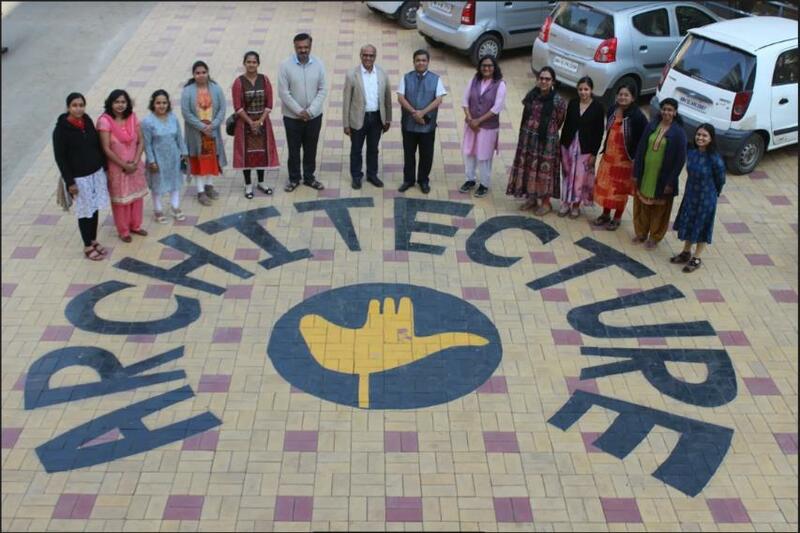 A lecture on Research in Architecture by Dr. Abhijit Natu & Dr. Vasudha Gokhale. 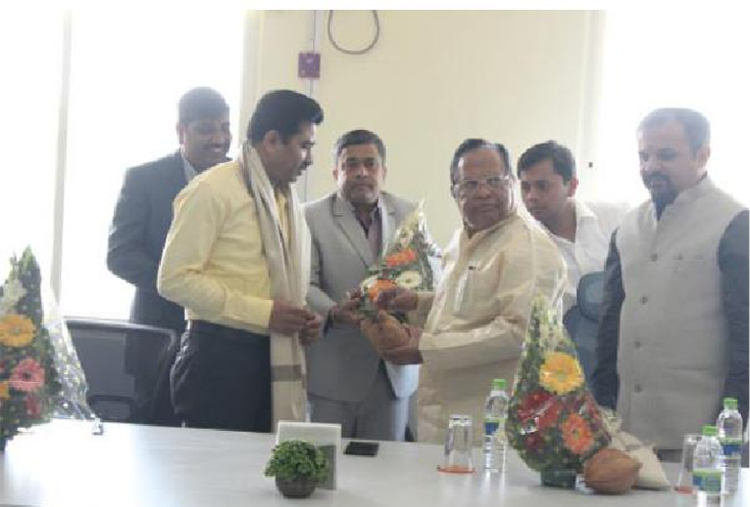 GUEST OF HONOUR: Dr.Abhijit Natu. Dr. Abhijit Natu while presentation. 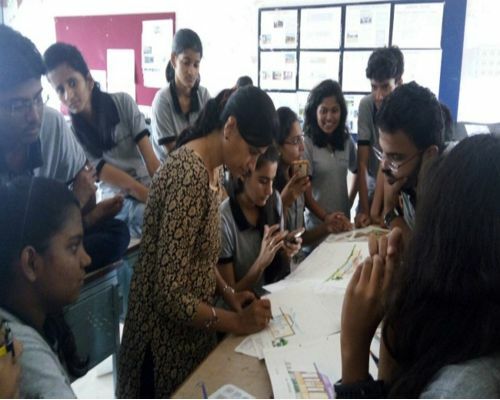 A Workshop on “Research in Architecture” part -2 was conducted on (1/08/2018, Wednesday) at S.B.Patil college of Architecture & Design, Akurdi Pune by Dr. Vasudha Gokahle for students as well as faculty members of the college. Dr. Vasudha Gokhale explained details of research types, research methods and design with examples. She also highlighted on topics of sampling techniques, citations and referencing in a research paper. This workshop will enable the students to prepare a research proposal which is a part of their syllabus. 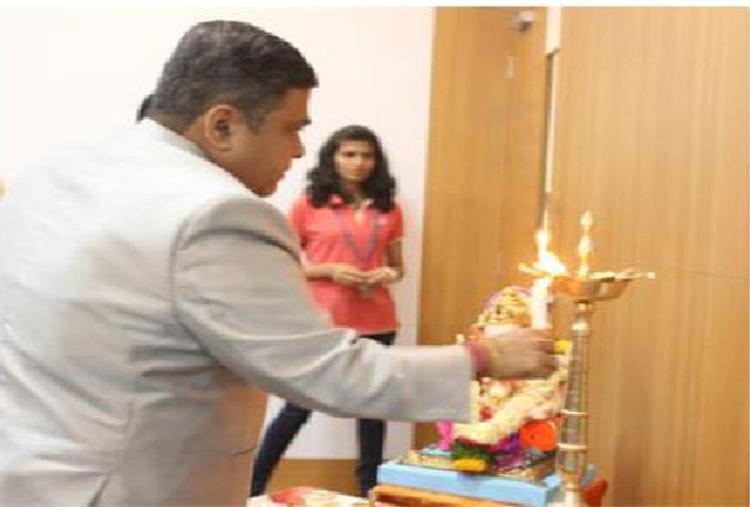 The workshop was an initiative by The Principal Dr.Mahendra H. Sonawane and Prof. Shilpa Patil. 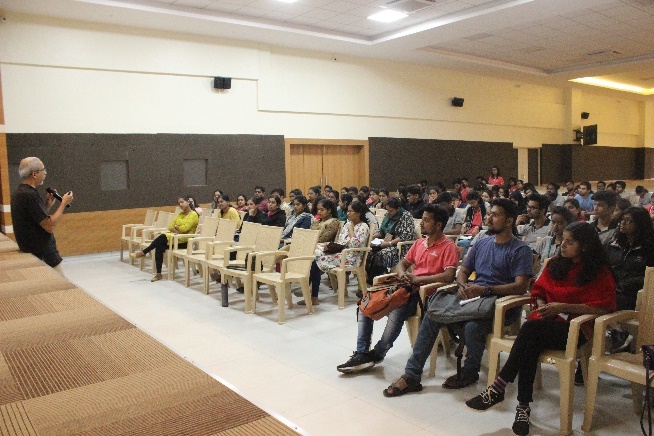 Wednesday, 01/08/2018 – Students interacting with Dr. Vasudha Gokhale while presentation. Hotel & Resort Deigning, Preparation for Professional Practice by Ar. Prashant Deshmukh. TIME: Session 1- 11:00 am – 12:15 pm, Session 2- 01:00 pm – 02:00 pm. In first session, Ar. 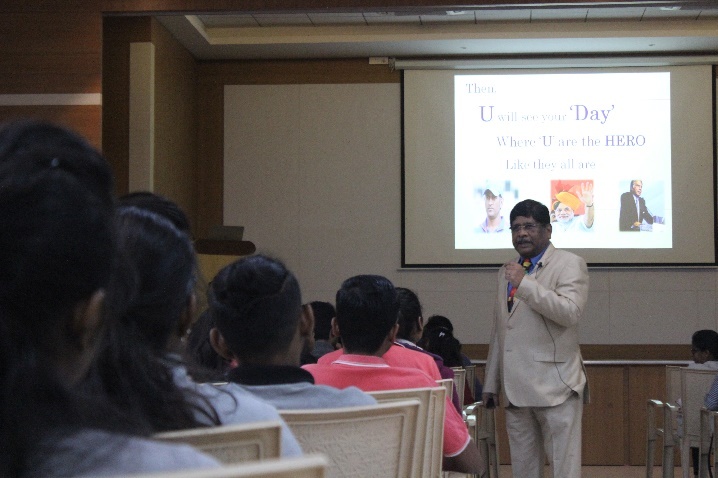 Prashant Deshmukh explained the students about different types of hotel & resort, their importance & the key requirements for its design through some of the national & international projects. In second session, he guided students, how to prepare & apply for internship, when and how to make the design portfolios. 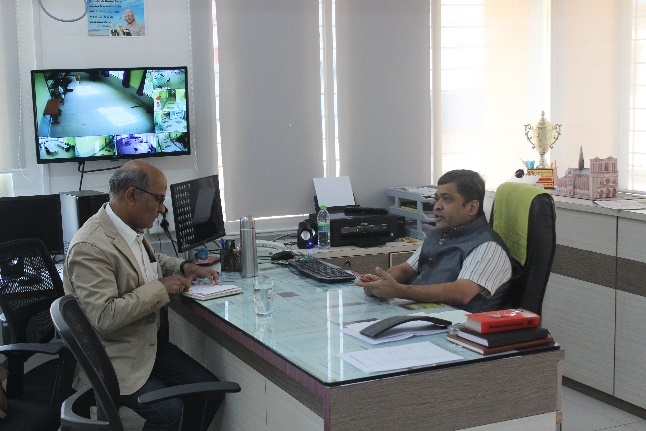 He also advised students to work hard & apply to the best Architects & architectural firms for internship to have a better career.A guest lecture was arranged by The Principal Dr.Mahendra H. Sonawane and Prof. Gurudeep Chikhalkar. 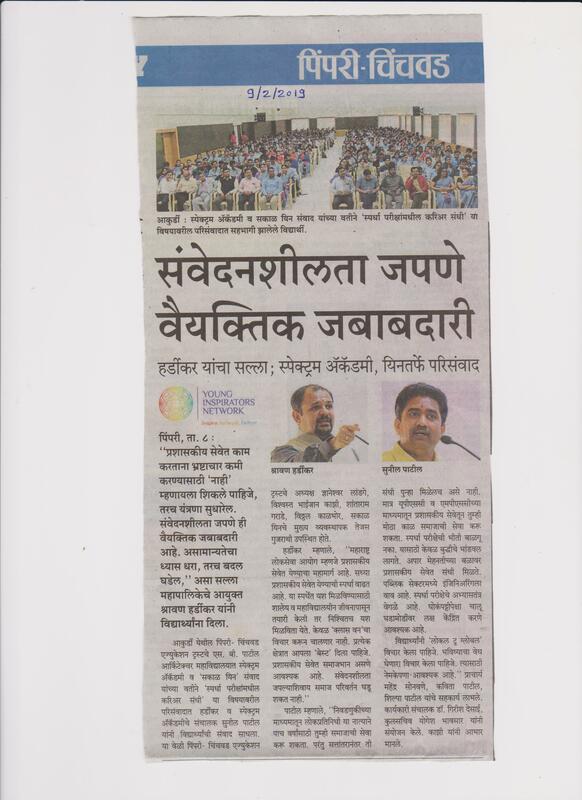 Sakal ‘ YIN TALK’ by Ms. Bhagyashree Patwardhan & Mr. Waseem Khan . 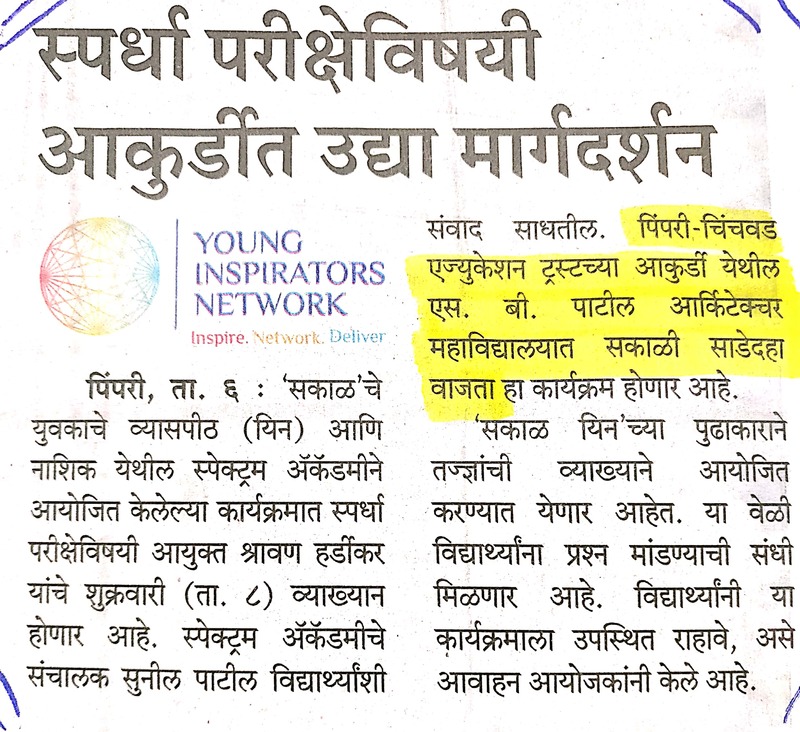 The field of designing is unique and hence it is necessary to keep innovating through novel ideas, that’s the concept behind Sakal YIN TALK( 04/09/2018, Tuesday). 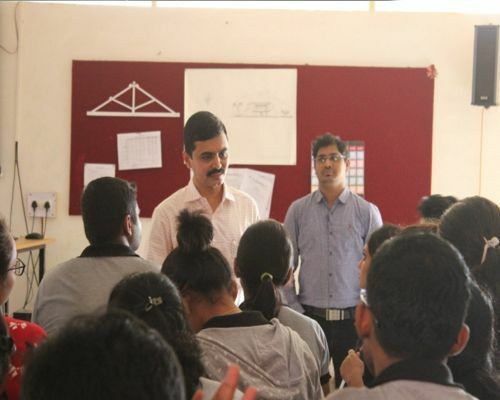 Where Ms. Bhagyashree Patwardhan , Mr. Waseem Khan had interactive session with students. 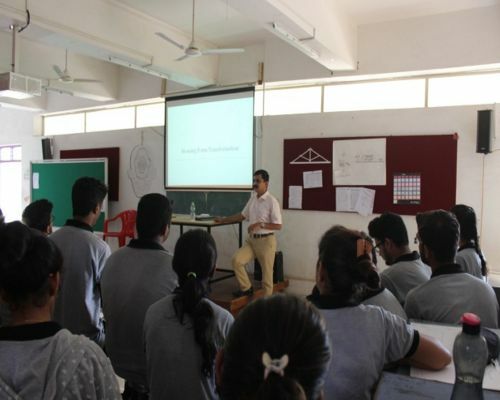 Patwardhan and Khan guided the students on the opportunities and changing scope of career in the field of designing. 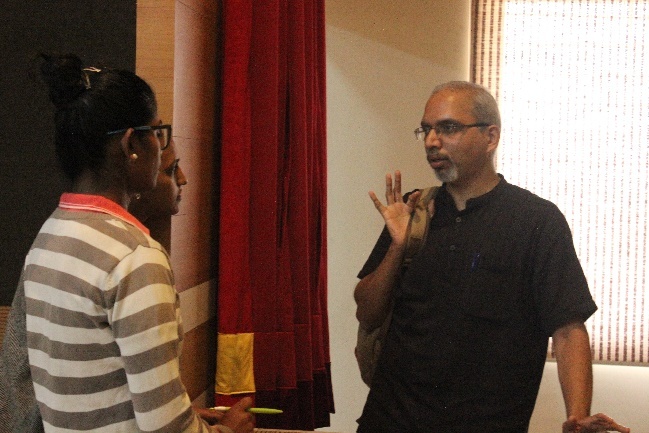 “As a designer must develop his or her unique method” added Ms. Patwardhan during interaction. 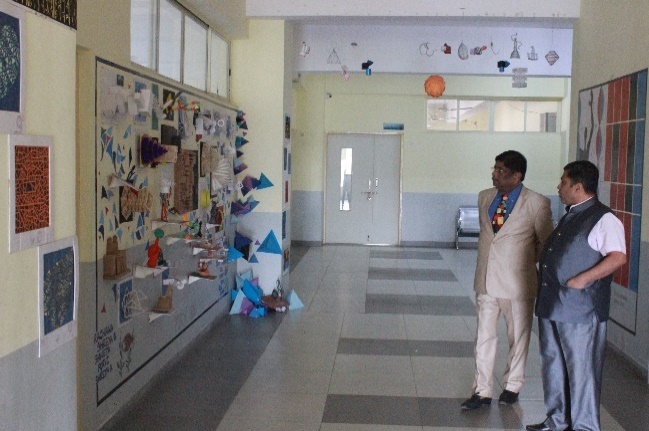 Mr. Khan gave advice to “Everyone need to express his or her own self through designing”. 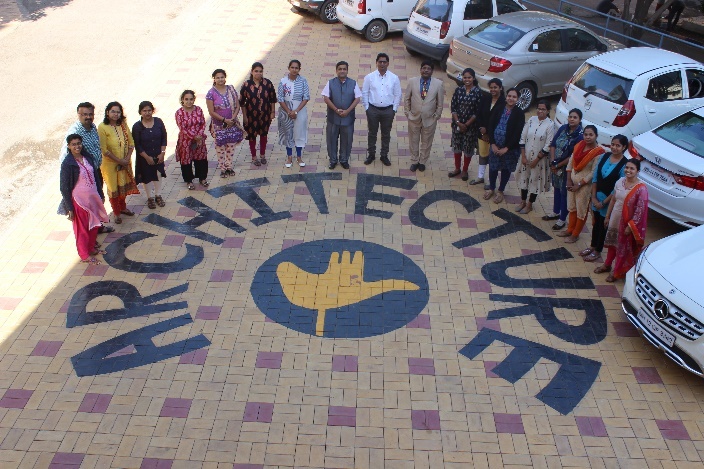 Students from S. B. Patil College of architecture & Design, PCCOE , Nutan Vidya Prasarak Mandal, Talegaon , National college of fine art, Indira College of Architecture, PDEA, Fine Aart College, Khadaki. 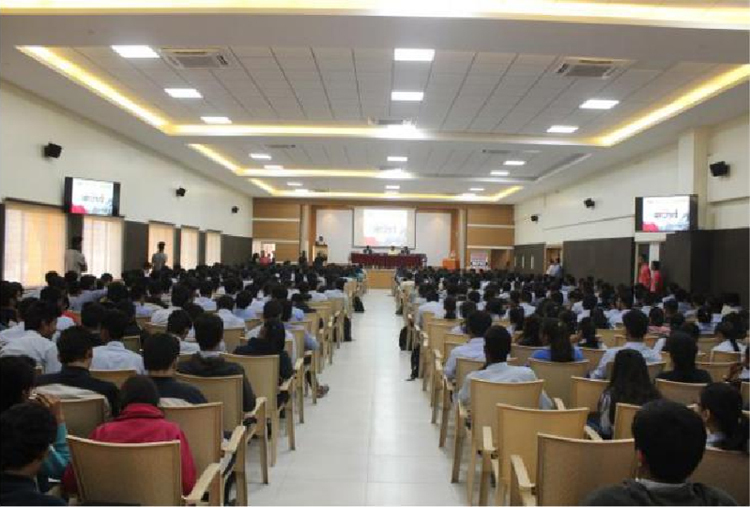 More than 750 students and 50 faculty members were present for event. This was one of the best response from Maharashtra region. 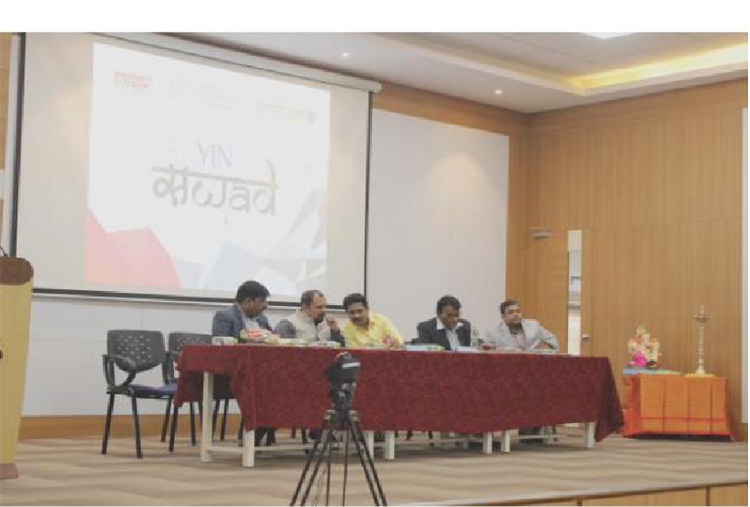 Mr. Santosh Raskar of Srujan College of Design, Dr. Mahendra Sonawane Principal S. B. Patil College of architecture & Design , Mr. Rajendra Mhaske of Nutan Vidya Prasarak Mandal, Talegaon, Mr. TejasGujrathi, Chief Managing Director of Community Network, YIN were also present on the occasion. 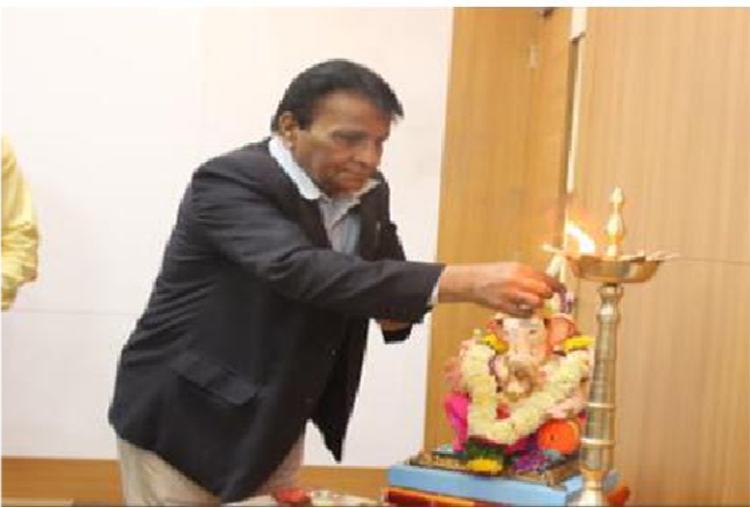 The Program was initiated by Sakal & PCET’s S. B. Patil College of Architecture. Tuesday, 04/09/2018 –Principal Sir & Faculty members with all honorable guests. Tuesday, 04/09/2018 –Principal Sir & Dr. Desai Sir with all honorable guests. Alternative Enclosures Construction Methods By Ar. Girish Deshmukh. Today’s building enclosures can make an attractive architectural statement. But these building enclosures can also pose significant challenges – after all, they form the primary defense against the elements. Air, water and thermal barriers must be continuous and properly placed within the enclosure assembly. If designed and constructed well, they will also support low energy loads. In broad perspective, basic architectural design is about designing different enclosure for different purpose in different climatic conditions. 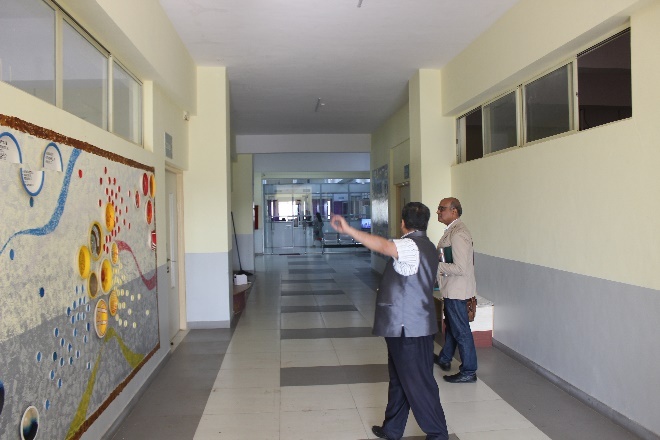 The guest presented various projects such s residential & commercial. To make students aware of using various alternative enclosure construction methods specially in low cost construction. Students have learned various low cost construction techniques for alternative enclosures & its implementation. Rendering Techniques by Ar. Neha Malsekar. 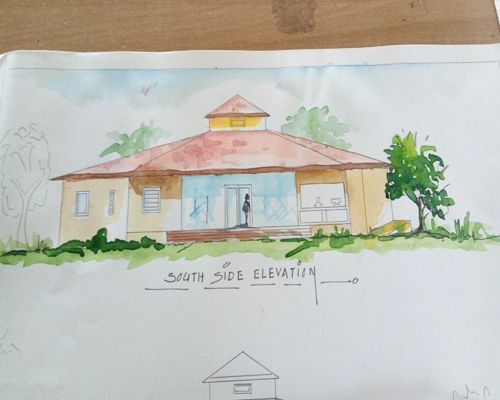 In the architecture profession, skills in producing graphic documents or visual communication are very important in order to effectively present the architectural design solution to a specific audience or client. To learn rendering techniques using various rendering mediums such as water colors, pastel colors, staedtler pencils & etc. Students have learned how to use various rendering mediums to enhance their ADG & AD Portfolios for better understanding & presentation. 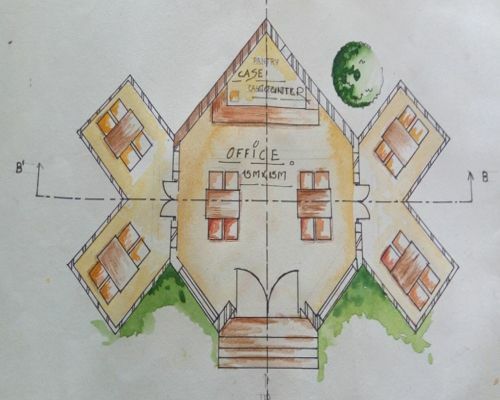 Housing Design by Ar. Parag Narkhede. In order to introduce students to Housing projects & design, the lecture was focused on the concept of housing, its deign aspects, its typology, social aspects of housing & all other factors to be considered for design mass housing projects. To understand - The concept of Housing. 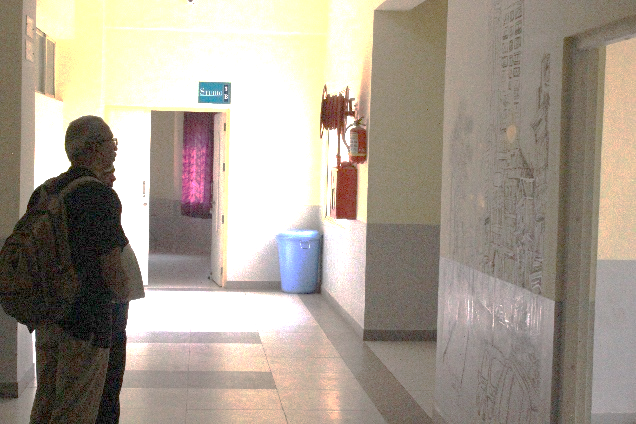 Students have learned the importance of Housing design with respect to various aspects.